We offer the latest in Laser Hair Removal technology. Fast and Virtually Pain Free. The Whole Body Can be Done in 45 Minutes or less. Finally say goodbye to unwanted hair! 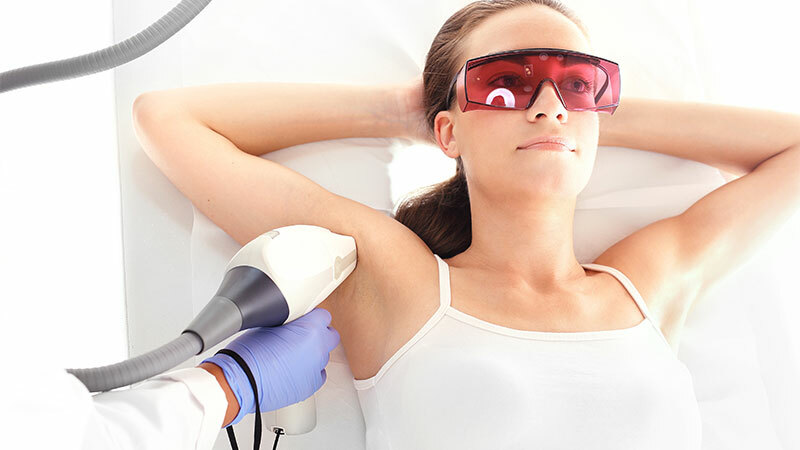 Laser Hair Removal is a near-permanent hair removal method that allows you to get rid of large areas of hair quickly and without the pain and discomfort of electrolysis, waxing, shaving, and plucking. This treatment is popular with both men and women. For women, the most common areas of hair removal are the face (upper lip and chin), legs, bikini line, arms, stomach, and underarms. For men, the most common areas are the back, chest, and face. Laser hair removal means that daily shaving is no longer necessary, so men who experience skin irritation from shaving can receive relief. The laser light destroys the targeted hair follicles without damaging the skin. Laser hair removal does not work on white, gray, light blonde, or light red hair. The pigment in the hair follicle absorbs the light from the laser, so without enough pigment, the device cannot destroy the follicle. Both you and your practitioner will wear special eyewear to protect your eyes from the light of the laser. During your treatment, the hand piece is held close to your skin, but it is not painful. Most patients report a feeling like the snap of a rubber band. Hair grows in cycles, but not all of the hair is in the same cycle at the same time. As a result, the laser only works on some of the hair during each treatment. Therefore, to remove all of the hair in a particular area, you will need more than one treatment. The number of appointments you need will depend on the amount of hair you wish to remove. Most people need 6 to 10 laser treatments spaced 4 to 6 weeks apart. Each procedure will reduce the hair by about 20%. How long do the results of the treatment last? There are no 100% permanent hair removal methods, but laser hair removal is the closest we have to permanent. Sometimes, there is some downy growth after laser hair removal treatments are finished. This hair is lighter and softer than the darker hair that was there before. Some people have a touch-up treatment on an annual or semiannual basis to remove any new hair growth. No recovery period is required after laser hair removal. For the first day, you may feel as though you have a slight sunburn in the treated areas. Any irritation should be less than you would experience with most other hair removal methods. We will give you instructions about cleaning the area and wearing sunscreen when outdoors. If you are ready to get started with Laser Hair Removal treatment, call Natural Foundations in Capitola at (831) 325-0202. Call now for a complimentary consultation.